Texts by Raimar Stange, Pirkko Siitari, Rune Gade, Karen McQuaid, Fabio Cavallucci, Natalie King, Djon Mundine & more. Design: Mette Flink & Art/Books. Published by Art Books Publishing Ltd UK, 2015. Distributed outside North America by Thames & Hudson. Available in North America through & ARTBOOK D.A.P. Søren Dahlgaard – Seeing is Believing, 128 pages. Texts by Else Marie Bukdahl & Lisbeth Bonde. Published by Viborg Kunsthal, Denmark 2012. Søren Dahlgaard – Growing Vegetables on a Coral Island Hibalhidhoo, 100 pages. Texts by Rasheed Araeen / Søren Dahlgaard & Eliza Tan. Published by Galleri Image, Aarhus Denmark 2011. Søren Dahlgaard – The Beauty of Chaos – expanding painting, 92 pages. Texts by Karla Osorio Netto, Aya Kinoshita & Søren Dahlgaard. Published by ECCO Contemporary Art Center Brasilia, Brazil, 2011. 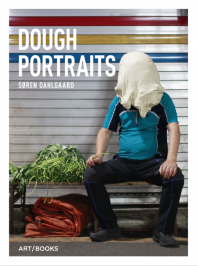 Dough Portraits Maldives, 40 pages. Texts by Barbara Stephensen, Amani Naseem & Søren Dahlgaard. Published by National Art Gallery of Maldives 2010. Dough Portraits Denmark, 12 pages. Text by Judi Lund Finderup & Henrik Holm. Published by Statens Museum for Kunst / The National Gallery, Denmark, 2008. Søren Dahlgaard – The Dough Warrior project! 56 pages, incl DVD. Text by Anders Kold, curator, Louisiana Museum of Modern Art, Denmark. Published by Stalke Galleri, Kr Sonnerup Denmark, 2008. Billedkunst – et fag i skolen, Rachel Zachariassen & Elin Østergaard, Hans Reizels Forlag, Denmark, 2019. Randers Kunstmuseum, Journal No.3/1 – Winter 2018/2019, p. 18, Denmark, 2018. Wunderkammer Liquid Form catalog, Esbjerg Kunstmuseum, Denmark, 2018. Dansk kunst i 10’erne by Lisbeth Bonde, 320 pages, Gyldendal Forlag, Denmark, 2017. EAT ME Trapholt Museum of Modern Art And Design, Kolding, Denmark, 2017. Ecovention Europe: Current Art to Reimagine Ecologies Museum De Domijnen, The Netherlands, 2017. Portrait Now! The Museum of National History, Frederiksborg Castle Hillerød, Denmark, 2017. Art+Climate=Change published by Melbourne University Press, 2016. 2° – Canberra Contemporary Art Space, Australia, 2016. When is a Neighbour a Stranger? Centre for Contemporary Art Laznia Gdansk, Poland, 2016. The Anthropocene Curriculum research project, HKW – Haus der Kulturen der Welt, Berlin, 2016. The Image Collection, Galleri Image, Aarhus Denmark, 2016. GERTRUDE STUDIOS EXHIBITION, Melbourne, Australia, 2015. The Anthropocene Curriculum, HKW – Haus der Kulturen der Welt, Berlin, 2014. GERTRUDE STUDIOS EXHIBITION, Melbourne, Australia, 2014. An Edge Effect: Art & Ecology in the Nordic Landscape published by Half Letter Press, US/DK, 2014. Whisper in my Mask TarraWarra Biennale – TarraWarra Museum of Art, Australia, 2014. Farewell to Experience Lianzhou International Photo Festival, 2013. New Garden City online cat., Trane exhibition center Gentofte, Denmark, 2013. PRIMI 3-year interdisciplinary research project with The National Art Gallery Denmark. 2013. Reality Bites – Works from Kiasma collection Finland, 2012. Offside Effect – 1st Tbilisi Triennale, Georgia, 2012. Your Boy will Amount to Nothing Digital Art Centre, Israel, 2012. Urban Interventions CCBB Contemporary Art Center, Brasilia. 2011. THE KABOOM PROCESS DVD special limited edition containing 7 videos. Foto Triennale.dk Brandts Photo Museum, Odense, Denmark. 2009. 10th OPEN International Performance Art Festival in Beijing, China. 2009. ONE – online cat. 28 pages. Published by Stalke.dk, Denmark. New Danish Art 08 – p. 178-181, kopenhagen publishing, Denmark. Wonder – Singapore Biennale 08 book + short guide book. TAKE OFF 20:01, ARoS, Aarhus Kunstmuseum, Denmark. (Text by Anders Kold). BLICK : New Nordic Film & Video 2001. Melting Pot, 2000, Glückburg Castle, Germany. PROMS4, 1999, Brandt kunsthal, Odense, Denmark. Bankside Browser, 1999, Tate Modern, London. International Young Baltic Art 1999, Berlin & Rostock, Germany.